Please click on the arrows to navigate through our publications. At present, the female self-employment rate across countries is still lower than the male self-employment rate. As successful entrepreneurship is regarded as an important driver for economic growth, the question arises whether equal start-up opportunities exist. The literature overview illustrates that differences in performance between female-owned and male-owned businesses can to a very large extent be explained with differences in industry affiliation, firm size, and regional location. The presented data for the BSR countries is showing simultaneously marked differences between female entrepreneurs in these countries. An online survey of German female entrepreneurs illustrates interesting findings. In a second part, the publication informs about the situation and perspectives for women in SMEs in Poland. This publication was developed as part of the flagship project of the EU Strategy for the Baltic Sea Region “Innovative SMEs by Gender and Age (QUICK-IGA)”. 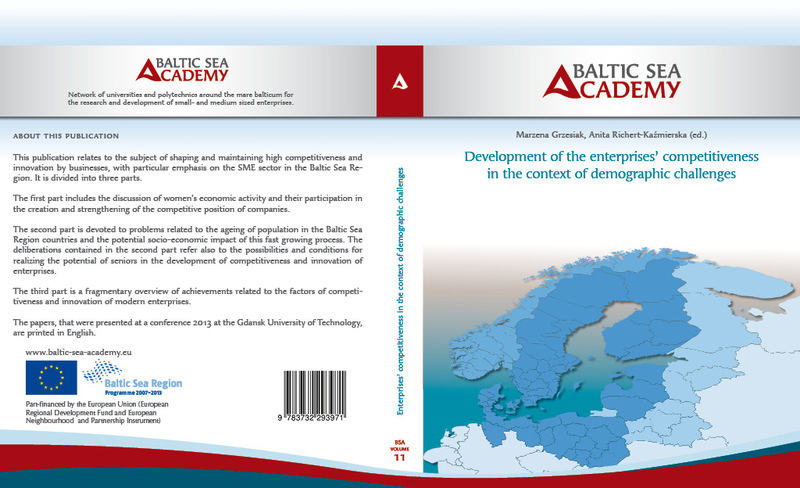 Demographic and economic structural change affect the development of the whole Baltic Sea Region in the future. Coping with these challenges requires initiatives aiming at labour market issues. A shrinking and ageing labour force entails the danger of shortage of labour supply in general while demand for skilled labour increases in the course of knowledge-based structural change. There are large potentials for the Baltic Sea Region to strengthen its competitiveness by better tapping its human resources. Among these an advanced integration of women in the labour market is at the top of the agenda. 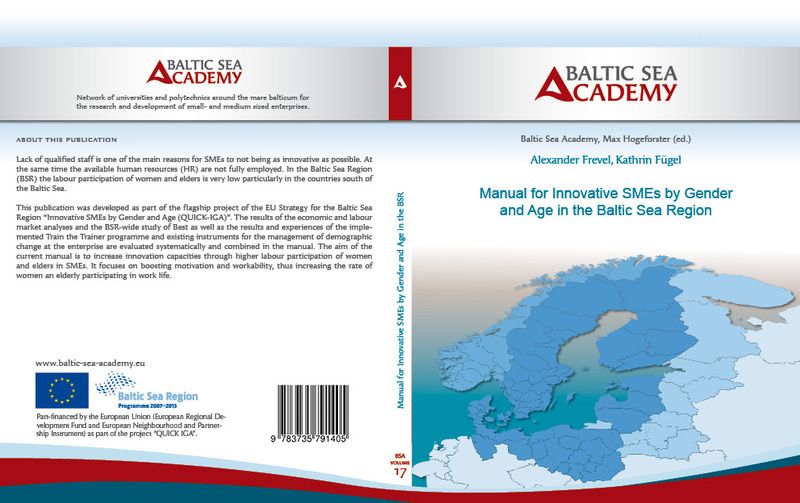 This book analyses the current economic and demographic structures in the Baltic Sea Region and assesses the development perspectives. In this context, it shapes the educational attainment and labour market involvement of women and points to considerable hidden potentials. are predestined for such close relations to customers and communities. But still SMEs hesitate to fully engage in CSR, mostly for their tight time resources and budgets. The authors of this book demonstrate that for SMEs in the Baltic Sea region CSR is a key to future success, that does not need to be overly sophisticated or costly. Women are still underrepresented as entrepreneurs in the Baltic Sea Region. 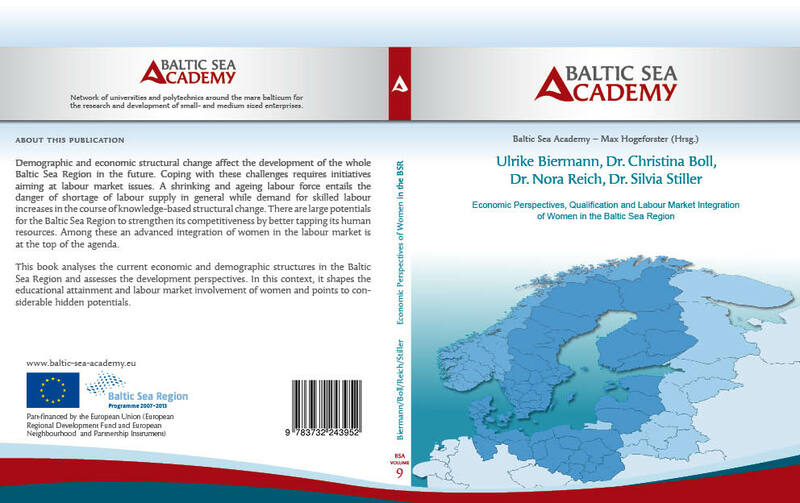 In the second part of this book the authors look into the barriers that hinder women from starting their own business and develop strategies to change this in order to tap two of the great resources of the Baltic Sea Region – the knowledge and creativity of half its workforce. 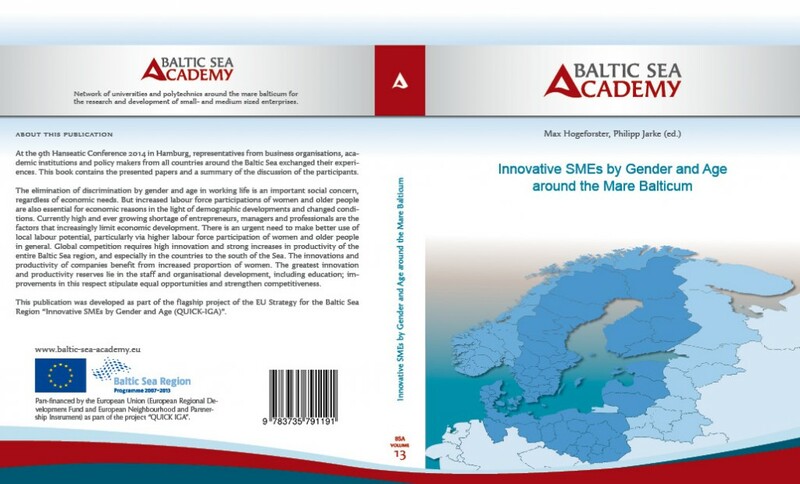 This publication relates to the subject of shaping and maintaining high competitiveness and innovation by businesses, with particular emphasis on the SME sector in the Baltic Sea Region. It is divided into three parts. The first part includes the discussion of women’s economic activity and their participation in the creation and strengthening of the competitive position of companies. The second part is devoted to problems related to the ageing of population in the Baltic Sea Region countries and the potential socio-economic impact of this fast growing process. The deliberations contained in the second part refer also to the possibilities and conditions for realizing the potential of seniors in the development of competitiveness and innovation of enterprises. The third part is a fragmentary overview of achievements related to the factors of competitiveness and innovation of modern enterprises. The papers, that were presented at a conference 2013 at the Gdansk University of Technology, are printed in English. supporting regional development in order to optimally develop human capital and competitiveness through gender and education policy. Part I of the book incorporates the strategy programme on “Age, Gender and Innovation: Policies and Strategies to Improve Employability and Work Ability of Women and Older People in the Baltic Sea Region”, whilst part II contains action plans for the Hanse Parlament (network of business chambers) and the Baltic Sea Academy (network of academic institutions) “Promoting the employment of women and older people”. At the 9th Hanseatic Conference 2014 in Hamburg, representatives from business organisations, academic institutions and policy makers from all countries around the Baltic Sea exchanged their experiences. This book contains the presented papers and a summary of the discussion of the participants. The elimination of discrimination by gender and age in working life is an important social concern, regardless of economic needs. But increased labour force participations of women and older people are also essential for economic reasons in the light of demographic developments and changed conditions. Currently high and ever growing shortage of entrepreneurs, managers and professionals are the factors that increasingly limit economic development. There is an urgent need to make better use of local labour potential, particularly via higher labour force participation of women and older people in general. Global competition requires high innovation and strong increases in productivity of the entire Baltic Sea region, and especially in the countries to the south of the Sea. The innovations and productivity of companies benefit from increased proportion of women. The greatest innovation and productivity reserves lie in the staff and organisational development, including education; improvements in this respect stipulate equal opportunities and strengthen competitiveness. The topic that is disclosed in the scientific publication “Building the socially responsible employment policy in Baltic states” is certainly relevant to the context of national economy and social policy. Experience shows that socially responsible employment policy measures are especially widely used in the old EU member states. Relevance of socially responsible employment policy is not decreasing because unfavourable economic conditions aggravate the employment of certain groups of people (especially the long-term unemployed, low-skilled, having low marketable professions and other persons). The content of the scientific articles by the authors of this publication allows to answer reasonably to questions about the development of socially responsible employment policy in the Baltic states. The results of accomplished analysis are relevant to the fact that they allow to reveal the problems that are encountered in the development of socially responsible employment policy. A special focus is given to the employment of females and elderly employees to boost the innovation performance of companies. Analysis of macroeconomic data carried out by the authors indicated that the employment rate among women and older people in Scandinavian countries such as Denmark, Sweden, Norway is much higher than in other EU countries. Thus the idea was born to identify and transfer best practices from the Northern European countries to selected countries of the Baltic Sea Region (Poland Germany, Lithuania and Latvia). The first part of the book is devoted to the description of the criteria that helped the authors select best practices and make characteristics of chosen practices. The second part of the book deals with conditions of the best practices transfer. In the last part of the book the transfers of best practices to the four BSR countries are presented. The authors from the Gdansk University of Technology focused on the one hand on the complex, and on the other hand on a practical approach to analyse the problem of low activity of women and older people on EU labour market. Lack of qualified staff is one of the main reasons for SMEs to not being as innovative as possible. At the same time the available human resources (HR) are not fully employed. In the Baltic Sea Region (BSR) the labour participation of women and elders is very low particularly in the countries south of the Baltic Sea. This publication was developed as part of the flagship project of the EU Strategy for the Baltic Sea Region “Innovative SMEs by Gender and Age (QUICK-IGA)”. 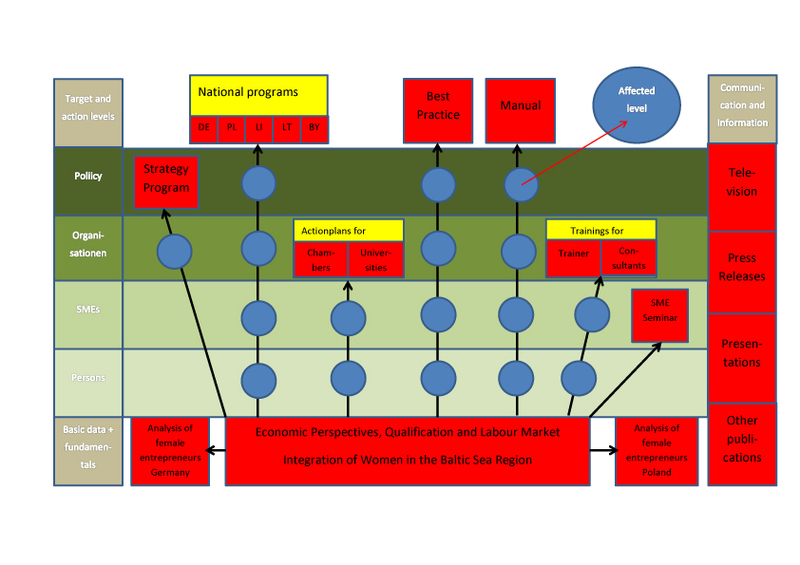 The results of the economic and labour market analyses and the BSR-wide study of Best as well as the results and experiences of the implemented Train the Trainer programme and existing instruments for the management of demographic change at the enterprise are evaluated systematically and combined in the manual. The aim of the current manual is to increase innovation capacities through higher labour participation of women and elders in SMEs. It focuses on boosting motivation and workability, thus increasing the rate of women an elderly participating in work life. Since the mid-twentieth century, the environment in which we operate is in fact described as turbulent, i.e. characterised by an unprecedented amount, rate, intensity and complexity of changes. In such a volatile environment the survival of an enterprise, and the more so its development and maintenance of high competitive position, seem to be extremely difficult. On the one hand, changes can create opportunities and provide the enterprises with chances for the development, on the other restrict or even block the possibility of their functioning in the market. In the monograph an attempt was made at classifying the civilization changes the modern entrepreneurs have to face in the fight for maintaining high competitiveness of their enterprises. Good practices are presented, for example the economic activation of seniors for companies. This book is a scientific publication for the purpose of its drafting, a review of most recent scientific literature on enterprise competitiveness and innovation and the direction and pace of socio-economic changes, with a particular focus on demographic changes, was conducted. Please click on the red boxes to view details about the results.